We found out about Thrapsano from the potter's wife who runs a gift store near the fabulous Heraklion Archaeological Museum. It is an hour drive outside of the busy streets of Heraklion, past the Minoan Palace of Knosssos and through some beautiful wine country. There are several potteries on the outskirts of the small village, and the potters working there are highly skilled in coiling and throwing the giant pithos, the large storage containers that have been made there for centuries. These are mostly family businesses: the sons learning the trade from their potters. I did not see any women working with the clay, though they did work in the offices. The kilns are fired with compressed olive pits, shot into the kiln with a blower burner. All of the pots are unglazed and the beauty of the clay with the effects of the fire markings produce a varied, natural surface. 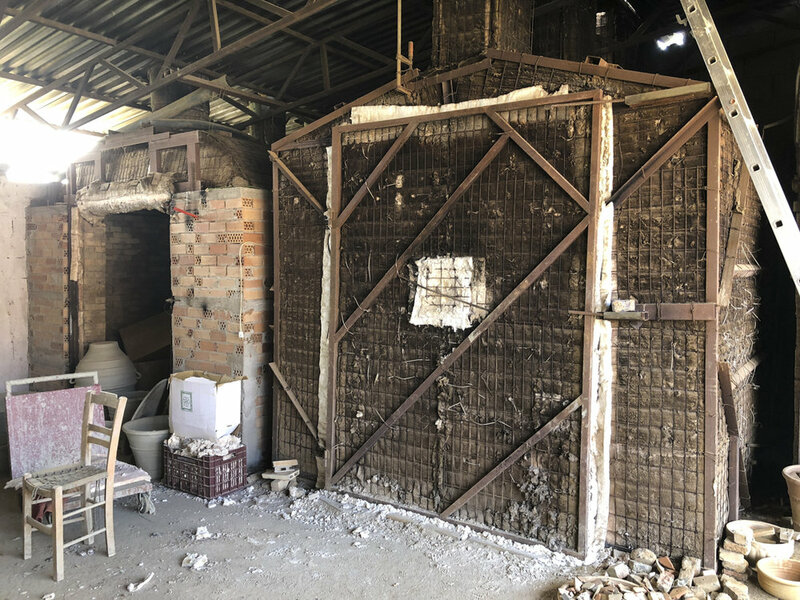 Be sure to watch the short video below of the olive pits combusting as they are blown into the kiln! I really really wanted to pack a few in my suitcase and am still dreaming about starting an import business and bringing some of these beauties to California! This video was taken at the Minos Pottery Cooperative in Thrapsano and shows a potter using the coil and throw technique to build up a large vessel. This short video shows the compressed olive pits shooting into the kiln instantly combusting. Olive oil burns hot!! A little wheel turning assistance is needed as the vessel grows!